Electric floor heating technology has come a long way in recent years. Today, it’s widely considered a highly affordable and comfortable heating method. The most important thing is getting it installed by pros. Electric radiant heating systems are simpler to install than other underfloor heating systems, such as those using heated water pipes. The relatively low impact of the renovation is one reason why people often choose this design for older heritage homes where owners want to minimize their impact, often starting with the bathroom or kitchen. One advantage to underfloor heating is that heat is distributed more evenly than most standard heating systems, reducing the presence of “hot and cold spots.” The air is warmest where you need it the most, cooling as it rises to the ceiling. The sensation of a warm surface underneath your feet is pleasant and comforting, especially when stepping barefoot out of the bath or shower on a cold day. That’s why many people opt to get heated floors installed in their bathroom first. Home owners often choose to install heated floors because they provide energy efficiency, raising the value of the property. 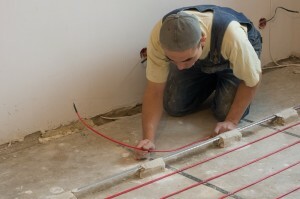 Underfloor heating systems operate a few degrees lower than most heating systems. The consistently warm air produced this way allows you to set the thermostat a couple degrees lower, which means you save on the heating bill. Builders, investors, and home owners also find that houses featuring heated floors tend to have a higher market value. It’s a feature that sets them apart from other properties on the market, and can help you get a higher return on your investment if you decide to sell. In a home without heated floors, options for remodelling or furniture arrangements are limited because part of the floor space is taken up by a heat register or radiator. The beauty of heated floors is that the whole system is tucked away, allowing you more freedom in realizing your vision for your home. If the system is properly installed, maintenance costs are low and your heated floor should last you for decades. Anyone in Toronto planning on upgrading their home with heated floors should consider contacting Avonlea Home Renovations, we’re known for its attention to customer satisfaction, fair pricing, and fine workmanship. Avonlea specializes in renovations of kitchens and bathrooms, especially in older homes.